This spring camp was a huge success. The drive to the farm was through beautiful spring countryside. The fruit trees, softly pink-tinged with the emerging blossoms, the purple hills surrounding the farm and the sudden patches of daisies that we came across would all on their own have made the trip worthwhile, even if there were no birds. But birds a-plenty there were, with our experienced guide, Brian Vanderwalt showing us more than 90 species over the weekend. 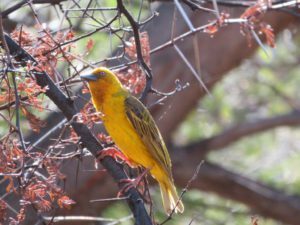 On the Saturday we birded on the Rhodene Farm property, along route R355, via Karooport into the Tanqua Karoo as far as the quaint Tankwa Padstal, then turning off to Skittery’s Kloof and coming down back to Ceres and Prince Alfred’s Hamlet via Gydo Pass. Then on the Sunday we did some early morning birding in the beautiful Witzenberg Valley – much moister with large farm dams and all very green and lush-looking after the browns of the Tanqua on Saturday.